With so many options available in the modern archery world, you first need to know some basic characteristics of the various arrow materials. Cons: can easily break, require constant maintenance, harder to use and less effective than carbon and aluminum. Recommended for: people who want to make their arrows. Recurves and longbows only. The most popular type of wood to make hunting arrows is Port Orford Cedar (POC). This is because it is harder to break, heavier in weight and deeper in penetration. However, a slight drawback is that it’s a little slower than other wood arrows. Pros: provide incredible performance and durability. Faster, lighter and straighter. They do not bend, and most are pretty hard to break. Can be customized more easily by changing the nocks, adapters, inserts, and weight systems. They also make tuning a much simpler task. Recommended for: everyone. Suitable for compound bow archery and long-distance recurve. There are many options when it comes to diameters, but the most commonly used is 5/16’’. On the other hand, spines are more restricted since carbon arrows have a much faster in-flight recovery. Pros: pretty affordable, provide great penetration and consistent performance. Also, there are many more sizes and spines to choose from. Cons: heavier than most carbon and wood shafting, can bend from glancing hits or hard impacts (but if not too severe, they can also be straightened right back). Aluminum arrows are offered in more spine groups, and diameters vary based on different spines, typically 11/32’’, 21/64’’, 5/16’’, and 9/32’’. Pros: The strongest shaft of all, pretty inexpensive. Recommended for: youth archery or bow fishing since fiberglass arrows are extremely powerful. Recurve bows only. Now, we’ve come to the personal stuff. General recommendations are certainly not enough till this point as the arrow must become one with the archer. Hence, how do we determine the specific parameters based on our characteristics? Step 1: Determine the length of your arrows. You do this by measure your draw length, add 0.5’’ – 1’’ to that number. Then you will get the appropriate arrow length. For instance, if your draw length is 28’’, your arrow should be no shorter than 28.5’’. Remember to measure your arrow from the bottom of the nock to the end of the shaft, leave out the broad heads. This will likely prevent the risk of shooting in your hand because the arrow point is always in front of the bow. Step 2: Adjust the weight. For hunting, it’s recommended that your arrow weighs in total (shaft, point, fletching and so on are all included) around 8 to 10 grains/pound of draw weight. For instance, if you have a 60 lbs. Bow (when drawing), your arrow should weigh between 360 to 480 grains. These aren’t fixed values but don’t ever use an arrow that weighs less than 5 grains/pound of draw weight. Step 3: Pick the shaft diameter. If you choose a smaller-diameter shaft, the penetration will be deeper, and the wind drift will affect less. It might also increase the speed of your shot. The most important trait to consider when choosing any arrow is probably the spine. To put it simply, the spine determines how much the shaft bends upon releasing, therefore, impacting the accuracy heavily. It may take quite some time to figure out the right arrow spine, especially when most manufacturers don’t provide specific values. However, it gives you a threshold like “appropriate for bows up to 55 lbs instead. Draw weight”. Of course, you can refer to a spine selection chart on the internet, but your best bet is to test it out in real life. Simple tip: For a right-handed bow, aimed target straight ahead, if the arrow goes left, the spine is too stiff. And if it goes right, the spine is too weak. That’s why before you can determine the right spine that suits your shooting style and technique, you will need to practice quite a few times. I have been using these arrows for a few months, and honestly, no shaft has broken or splinted. Also, all of the nocks are very good. There is an interesting thing I want to tell you about this product. It’s that when I first saw this set of arrows on the Internet, the picture showed me green and black fletchings. However, all I got are red and orange fletchings. This is not bad at all. In fact, red and orange better color as they are much easier for me to spot in the tall grass. I remembered that I once used one of the five arrows of the set to kill a big elk with just 1 in and out shot. And after I killed it, I pulled the arrow out of the tree it hit, changed the broad head. Then I killed another one with the exactly same arrow. The point here is that you can use the same arrow more than once and it can still hit the rocks. Therefore, just don’t miss and there won’t be any problem. – It is 20’’ in length. – There are five arrows and half-moon nocks. – It comes with 5-year warranty. – The arrows come with lightweight carbon but strong shafts and improved wall thickness for extra durability. – These arrows are compatible with Penetrator, Ghost 350, Jackal and Wildcat C-5 crossbows. – There is epoxy glue used on inserts as well as nocks. – These arrows are quite basic. – The way the arrows fly can change with heavy broadheads. To be honest, these are the best hunting arrows from Huntingdoor. In details, these bolts can shoot true, and they are the most durable ones I have used. About the weight and length, they are perfect. Additionally, this product is specifically made for longbow shooters so if you are a long bow shooter, just go for this one. However, what satisfied me when I bought these arrows is their customer service. I’m pretty sure that you will find their customer service the best you have ever dealt with. I once asked them whether they had any hunting arrows of a certain length and weight. They said “no, really ” and they just had something that was close, not exact to my numbers. Therefore, they offered to make new ones according to my requirements. Mazing, huh? – It is made for bows with a draw weight of between 40lbs and 60lbs. – The arrows have a length of 31’’ and the shaft diameter of 5/16’’. – The body of the arrows is made from wood, and the end is composed of 3 black feathers. 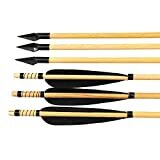 – Each of the arrows is fletched, nocked and they are all available for you to shoot for target practice and bow hunting. – The product is specifically made for traditional long bows and recurve bows. – These arrows cannot be used with a capture rest. – They are heavy and sometimes shoot slowly. – The arrow tips are held on with a pin, not glued. – They are made of wood and can be bowed easily. I have just purchased this last month, and all of the arrows was shipped and arrived at me on time, which really impressed me. Till now, every one of these arrows is very good quality. I have to tell you about the colors of their fletchings, they feature blue and white feathers, and honestly, they are so beautiful. Now, I shoot these ones with my favorite recurve bow, and they can still hold up great. Maybe I haven’t used them long enough, but there has been nothing wrong with these arrows since the first time I used them. There are no feathers peeling off, and none of the screw-in point inserts getting loose. Additionally, I guess they must use high-quality glue as some arrows have gone deeply into the wood and their tips did not pop off. I mean everything is still fine with the tips even when I have to use my both hands to pull them out very hard. Last but not least, there are six arrows available for, which means they provide you one more, compared to their counterparts. – It has Truelight parabolic feathers coming along with right-wing helical offset. – There are replaceable plastic nocks and screw-in tips which are made of steel, however, the style can vary. – These arrows are specifically accurate for bows with the weight of 15lbs to 50lbs. – The inserts are almost impossible to get into the arrows and you have to grind them down with a dremel tool. – The nocks are poorly glued so they are likely to come off easily. In conclusion, the best hunting arrows can have a very big impact on your hunt. Hence, keep on doing your research to find out one that suits you the most. It might take some time, but the reward is worth it.